Another cannabis entrepreneur is ready to come out of the ‘cannabis closet’. His name is John Khainson, and he’s one of the founders of LeafedIn.org. The Marijuana Times sat down with one of the leaders of the cannabis map-based app almost exactly a year ago to learn more about the networking opportunities and work they are trying to accomplish within the cannabis community. Last June, he requested we use the pseudonym Oho Herer – a name the founders use to hide their identities. Now, he’s going on the record with his real name. Coming out of the cannabis closet isn’t a given in this industry right now, he explained. The map-based app has been a huge success over the past year, and now that it’s taken off he is coming out of the green closet. Khainson used to work as a product manager in the financial and technology sector. Like so many others dabbling in the cannabis business environment, using his real name threatened his ‘normal’ job. The tech expert lives in Southern California and has been moonlighting in the cannabis industry for about a decade until recently deciding it was time to go all in. “I started getting the idea for LeafedIn.org because I saw that we’re reaching a point where the nation as a whole was telling us that, ‘Look, we are okay with marijuana’, and I want to give the small marijuana business owners and community an effective networking tool to help them through this transition into a mainstream market.” A year since the launch of his app, he’s bringing his expertise to the cannabis industry. “Try to imagine working in an industry that’s been kept in the black market for so long,” said Khainson. Those who work in cannabis know that it’s a gamble to come out of the ‘green closet’ because the plant remains so stigmatized. There’s even a social media campaign to end the stigma of cannabis. LeafedIn is a networking platforms for all members of the cannabis community. The app is a map that focuses on individuals connecting to others, “we are all about connecting people to people directly, and we are the first to encourage such a model in the industry,” he said. LeafedIn is currently available in the Apple and Android app stores for download, free of charge. Most smartphone users depend on their devices to figure out where they are going, who they are communicating with, and for music to listen to along the way. The numbers are in LeafedIn’s favor, as 93% of their digital time is spent on map-based apps. That’s only a few percentage points behind music and instant messenger services. While apps like Spotify and Facebook remain at the top of the list for most popular apps downloaded, LeafedIn is meeting a need for map-based cannabis apps. 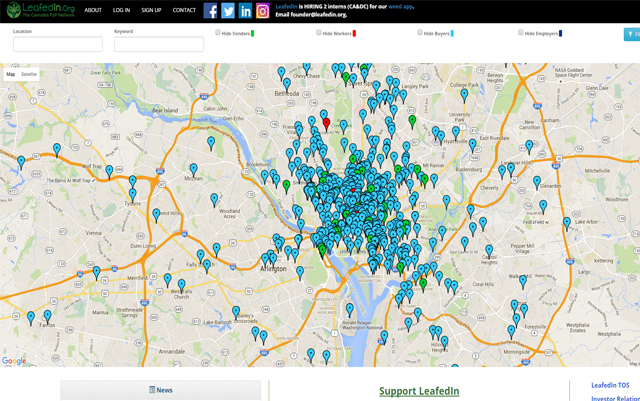 Unlike Weedmaps and Leafly, which can show you the closest marijuana shop or explain a strain, LeafedIn has users create profiles that are user-centric. As the “world’s first peer 2 peer network,” the app creates an easy way for workers, employers, buyers or vendors looking to connect. For example, it’s great if you’re a grower in need of trimmers, or a vendor looking for other businesses big and small. Cannabis sales – and mobile apps – are projected to see increased growth over time. 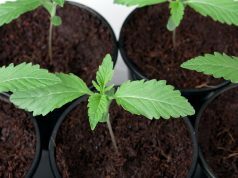 The legal sales of cannabis are poised to reach $21.8 billion dollars by the year 2020, according to the ArcView Group. Six billion in California alone. Pair those numbers with the mobile app boom, which could generate around 189 billion U.S. dollars in revenues via app stores and in-app advertising, and you have yourself a viable business idea. “For me, it’s really about creating a community as opposed to other products in the market which connect businesses to consumers,” he said. A well-known online connector for the cannabis community, Khainson has spent countless hours helping small businesses with business advice and shared connections for those working to get their cannabis start-ups off the ground. One user, a Florida woman with a medical marijuana patient consultancy, gave the app all five stars because it’s been a helpful tool in connecting her to medical marijuana clients. 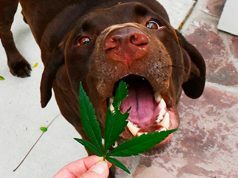 There’s even an official LeafedIn.org community group on Facebook where people who work with cannabis can feel more comfortable talking openly about their cannabis businesses, sharing photos and grows. It’s also a great way to connect with others in the cannabis community while getting around the anti-cannabis advertising and post restrictions enforced by Facebook. Speaking of legalization, hundreds of the most influential cannabis business executives and advocates in the country are flying into the District this weekend to lobby Congress for the reformation of America’s cannabis laws. 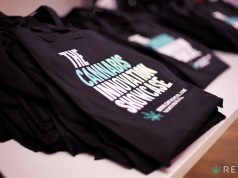 The annual tradition is organized by the National Cannabis Industry Association (NCIA) and takes place the 16th and 17th of May.